Sonnes Organic Foods Inc – Since 1946 #11 GREENLIFE® POWDER ~ 4 oz. 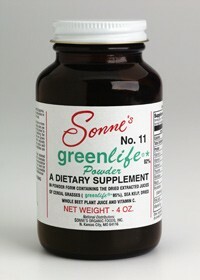 #11 GREENLIFE® POWDER ~ 4 oz. This GreenLife® product is a powdered form of #10 GreenLife®, without papain. It is 95% organically grown cereal grass juice and 5% dried whole beet plant juice and sea kelp. Because it is powder, it is ideal for individuals with swallowing difficulties, and may be mixed into liquids or simply sprinkled on food. Recommended Dosage: One well-rounded teaspoon (~4g) per day, or as needed or desired for dietary supplementation. Directions: Sprinkle GreenLife® Powder on food, or it can be mixed with applesauce, water or fruit juice. Can also be taken blended with vegetables, milk, or fresh fruit to produce a delicious smoothie. Literature: "Your Life," "The Cereal Grasses," and "GreenLife® - Natural Vitamins"